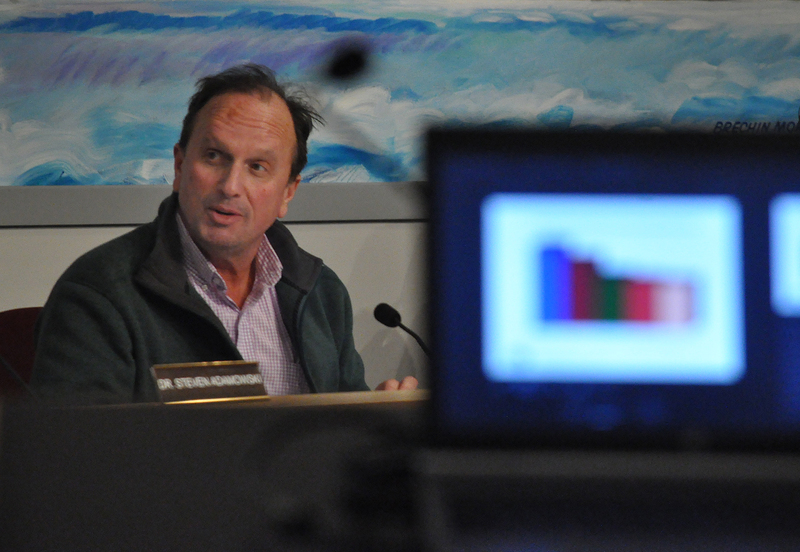 Norwalk Board of Education Chairman Mike Barbis, Jan. 15 in City Hall. NORWALK, Conn. – There are more questions than answers when it comes to a bill proposed by State Senate Majority Leader Bob Duff (D-25), Board of Education Chairman Mike Barbis said. The bill would give a municipality’s chief elected official the ability to choose who is Board of Education chair, if that municipality spends more than 50 percent of its budget on education. Norwalk meets this criteria, as 53 percent of the 2018-19 budget is directed to Norwalk Public Schools. Norwalk’s chief elected official is Mayor Harry Rilling. “What’s the purpose of this proposed bill? “What problem is this proposed bill trying to solve? “I think we need to see the answers before we can give any reaction,” he wrote. Duff said the proposal has nothing to do with Norwalk specifically. Mayor Harry Rilling did not reply to an email asking what he thought about the bill. Rilling said last week that Duff had not spoken with him about the proposal. Norwalk’s Mayor is ex-officio the Chair of the Board of Education, but only votes if there is a tie. Rilling and his predecessor, Richard Moccia, have typically not presided over BoE meetings as chair, which has allowed a Board Chair elected by other BoE members to run meetings. Duff did not reply to an email forwarding him Barbis’ comments. “This bill is concerning in a number of ways. It essentially ignores and overrides city charters and the real purpose of the bill is unclear (i.e. what problem is it trying to solve?). In addition, how many municipalities across the state would be affected – this would likely be triggered in small districts/towns? How would this work for regional/unified/consolidated districts that encompass more than one municipality? If an elected chief changes every two years, how would that impact the sustainability of the board (where the rest of the members might be elected to four-year terms)? Would this remove some of the independence and partiality of a BOE and city leadership? “Hybrid boards (a combination of elected and appointed BOE members) is not a new design, but usually it’s a decision made via city charter and consists of a 50/50 split – or something close to that, with the mayor as a member (i.e. New Haven). This is in definition a hybrid board, but it is problematic in implementation. Great points by Barbis and Corbett. This is a power grab by Duff and he based on opinion and anecdotal evidence. What’s wrong with proposing Norwalk’s Mayors, who traditionally have no significant business management or financial skills proposing the BOE’s Chair ? Especially when our recent well business qualified BOE Chairs use professional search to secure Top Talent Superintendents and our Mayor uses “soft searches” placing ads ? Maybe Norwalk really is”CT’s Greatest City”. But not for its taxpayers and residents. In Norwalk, the Mayor already has control, through the Board of Estimate and Taxation, over the amount of money the BOE receives each year. What’s the problem? In Norwalk, the Mayor already has a statutory impact, through the city’s Charter, over what goes on at BOE meetings because he/she or a designee is supposed to preside at all board meetings. Also, the BOE chair is only a single vote. What hypothetical Mayor/Board problem can be solved by a single vote? Does this bill imply that it is imperative for Mayors to have BOE chairs who are either members of the Mayor’s political party or just beholden to the top official in the city? And finally, why focus on the BOE chair? The key educational player in any town or city is the superintendent, who must answer to the MAJORITY of the BOE and work closely with the Mayor. A lot of good questions and puzzling ones at that. But the trends are obvious when putting this in context with merging school districts, mandating certain start times, and probably other goodies I’ve missed in the legislative agenda. It’s a land grab by an entity that is so poorly managed, their only response to the financial crisis they’ve created is to consolidate more power and strip the ability for responsibly run towns and cities from governing themselves. Seriously, is there one bill being proposed by the majority that returns any autonomy to the towns? Is there one bill that makes doing business in this state less costly? Call the strategy behind this bill what it is. Taxation without representation. Regarding Senator Duff’s comment about block grants for education with no accountability. This may be the case in some districts, but it doesn’t have to be that way. In Norwalk, there are already additional processes to create and approve the budgets, including the use of the BET (members of whom are appointed by the Mayor) and Common Council. To increase accountability, a district could (and should) have a strategic operating plan and aligned with clearly defined measurable goals that are monitored and regularly reported on. The budget then aligns to the strategic operating plan. This is true accountability. The real question is how does the strategic operating plan for the school district align to the strategic operating plan and vision for the municipality? What reporting mechanisms exist to increase accountability? Examples that other districts and municipalities might want to consider are things NPS already does, including regular reporting out monitoring data, releasing an annual report, and use of a performance contract for senior staff. Simply having a chief executive appoint one board member, who is the chair, may ensure that chair is accountable to the chief executive, but it does not ensure accountability overall or to the broader community. In addition, if the rest of the board disagrees with the selection of the board chair, it could result in stagnation or dysfunction to accomplish anything productive for students or the adults who are employed by the district. Let’s be clear. The Mayor is ex-officio Chair of the Board of Ed, which means he could attend and preside over the meetings, without a vote, JUST AS HE DOES AT COUNCIL MEETINGS. His role on the BET is as an ex-Officio member WITH A VOTE, and with the authority to appoint all of the other members. The Mayor of said City shall be ex officio a member of the Board of Estimate and Taxation and shall have a vote in any of its proceedings. The Mayor shall preside at all meetings of said Board at which (s)he is present, and at all meetings of said Board, four members shall constitute a quorum, and the concurrence of four votes shall be necessary for the transaction of business. The Mayor continues to use administrative changes to allow him to delegate portions of his job to others, just as the By-Laws of WestCOG were re-written to allow him to appoint someone to attend in his stead there. Is it too much to ask that he actually attend the BOE meetings?